In the last episode, Ebony, feeling he had come to his wits’ end, attempted to pray for a “reasonable” means of livelihood. His involvement in online scams had not yielded the steady windfalls he had expected. However, he cut his prayer short when he sensed he was about to have a supernatural encounter and invited his sister, Razor, to help him fathom what was happening. Will Razor, whom Ebony has repeatedly described as evil, help or worsen his situation? As Ebony himself asked, is he ready to change or he just wants to flirt with God to get some financial stability while continuing in his old ways? Also, he did say his beautiful neighbour, Tasia, was due back. How will her return affect Ebony’s bumbling steps in God’s direction? Answers and unexpected turns await in this episode. Have fun! Shortly after 6 p.m., I noticed my key bunch was in my trouser pocket and since Tasia’s key was in it, I decided to sit in her flat, rather than stand outside. I hadn’t bought Razor’s suya* but I figured we could do that when she arrived as I had no money on me. Nothing could convince me to enter my flat to get some money. I kept Tasia’s front door open to see when Razor came. About 6:20 p.m., I heard a knock on my front door and peeped out. Razor had arrived and I invited her over to join me. The moment she stepped on Tasia’s welcome mat, she jumped back as if she had walked on live coals. She moved to my porch. I locked Tasia’s door and followed her. When we entered my flat, I felt we would talk in the living room since I had been praying in the bedroom before taking fright. But Razor turned and bolted. “What is wrong with her today?” I asked myself, only to come outside and see her crying and babbling by the ixora hedge in front of the house. I didn’t know what to do but call her repeatedly. This went on for about three minutes. Then she seemed to be nodding and turned. She was coming back to my flat. I ran to Tasia’s side of the house. If Razor has gone mad, I need to stay far from her. She beckoned on me and went inside with the tears still streaming from her eyes. I approached gingerly but when I looked in and saw her sitting on the sofa, weeping, she seemed harmless enough and I walked in. I chose an armchair some distance from her and sat. I kept quiet and she continued. “What? …” Razor cut off any further protestations. I was warming up to the story. She had stopped to cry but she sensed my impatience and continued, albeit in between sobs. “I had always thought I would be at least 38 like Dad before dying or I could even buy myself more time with higher sacrifices. But as the Holy One spoke, I knew He was telling me the truth. My defences fell away and I fell in love with Him. He is pure and totally good. I accepted his offer of a second chance and asked Him to be my Lord henceforth.” And she started weeping really hard. We heard a car arrive and behold, it was Tasia! In a taxi. I ran out. She was a day early. I was expecting her kids in the car but she was alone. I wanted to help carry in her suitcase but she wasn’t carrying any. It was just her handbag and a big look of concern on her face. *Ikemefuna is a male name in Igbo that means “Let my power not be lost”. Have you ever been in a situation where you felt all hope was lost and God’s mercy stepped in to make things fine again? What is your take on the saying, “Serving the devil is a poor choice because you will lose more than you will ever gain”? Have you experienced or observed parental favoritism anywhere? Do tell us about it and how it affected the children, especially the favoured one. God bless you too, my dear! I thought what I said about our missionary God in the prologue would give a clue. ???? a man serving the devil is living in doom because the devil came to steal and destroy, but the coming of Jesus was for us to have an everlasting life and peace. Very true. Bless you, Erico! indeed this story is interesting. God has his own ways of changing us. I didn't expect the twist in the story although I like how anxious it made me be and now it became clearer that the Devil ? does not respect any age and can use any anyone to do his dirty job .Nice work, I can't wait for the next episode . You're right, Emmanuel! That is why we need to catch the children young for Christ. It's unfortunate that the father in the story bequeathed strange powers to his little girl. May God help us to be a blessing to the children in our lives, rather than being the conduit through which evil will enter their lives in Jesus' name. serving the devil is really a poor choice for to live and die in Christ is gain. if u're to die at 30, why are u on earth cos u have not even achieved anything in life. oooh so happy for the turn of events. waiting for the next part. NICE ONE MA. Praise God! I'm glad you loved the outcome in this one. The next episode is coming soon. You are blessed! Very captivating story with an interesting turn of events! As I read I think about cultural/gender differences and expectations. I never thought Tasia was coming on to Ebony, but at the same time I grew up with the saying 'shun all appearances of evil'. 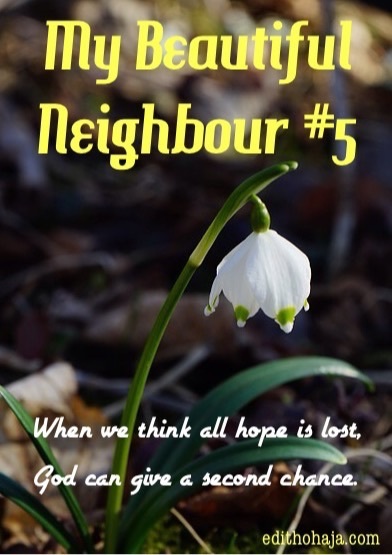 The further I read in your story I am reminded how that saying has crippled so many well-intentioned Christians from displaying the love of Christ. Sometimes we get so concerned about what others might misconstrue about our kindness that we fail to act at all and so deny someone a chance to see 'Christ' in the flesh. So, I'm glad you chose to show Tasia unabashedly loving as Christ would and I'm thrilled that Razor has been converted. No one is ever too far gone to be reached by God. We simply have to believe that and live it out every day. Looking forward to the rest of the story! So delighted to have you here, Carlie! I am so glad I wrote this story. The feedback has been a lesson of its own to me for the very reason you pointed out. Many have seen Tasia as the villain. In these parts, it's not just religion, it's the culture. Women are supposed to be reserved and not forward as Tasia seems to be. She, being biracial, is probably unaware that her niceness can be misconstrued. Thanks for reading and by God's grace the rest of the story will be very satisfying. Blessings on you and yours in Jesus' name. i love the part where Razor opened her heart for God to come. it has not been like that for most people. i pray God help us to know him more. Amen and amen. God is always ready to welcome those who heed His call. That is why we should tell people about the saving grace of our Lord Jesus. We never know who might answer His call. Bless you! This story is an interesting one. Without God, life is nothing, we are nothing. Because God is the tree and we are the branches, if we are cut off from the tree, we are nothing. Waiting for the next episode! Thank you for that reminder. You are blessed in Jesus' name. Glory to God! Glad you're enjoying the story. Thumbs up, ma! This is a nice piece. Truly God is always forgiving and is ever willing to make us his. All we need is to show a willingness as he never forces us to come to him. I agree. Someone said that the Holy Spirit, who brings conviction of sin, is a gentleman. He expects us to willingly accept the truth that we are sinners and receive the free gift of salvation of our own volition. Cheers! This is a shocker. I didnt see it coming. Razor has made a good choice by choosing God, it is up to Ikemefuna to make his own decision. You're right. A life lived in and for God is the best kind of life. Razor's ability to change shows just how strong the power of the Lord is to reform anybody irrespective of how the person may have behaved in his life. Also, the change had a positive effect on her brother, Ebony, thus proving that we can effect change in others through making positive decisions ourselves. nice turn out, didn't expect what razor did.....woah! Ebony is a really structured character. i kind of wonder about his build up and what inspired you to create the story around him. It's really quite realistic! It's the Ponzi craze of the recent past. I wanted to do a story showing the futility of doing such a "business" but by the time I got round to it, the Ponzi thing was waning. I needed another angle to generate interest, hence the beautiful neighbour. i don't know where to start from or what really to say. God's mercies have no bounds and like the good father that he is, he reaches out to all seeking to enter into our hearts to sup with us. Everyone has equal opportunity to answer to his call. As for the story, it's a beautiful twist of faith. #smiles Its beats every of my imagination. Glory to God! We should never write anyone off because there is nothing God cannot do. You are sooo blessed! God's love and mercy toward us is great. That is why he is ready to accept us anytime we come back to him. This episode tells us that nothing is hidden from God. So, as Christians, in whatever thing we do, we should try to do good in order not to incur his wrath. Wow what a nice story. This suspense-filled story is really captivating. I was just reading to know who Tasia really is. Could she be an angel? The story just shows us that God doesn't want us to perish in sin and just as Razor accepted Jesus and was saved, sinners can also accept him and be saved from the devil, who only came to kill and destroy but God is always ready to give us a second chance. Nice one, Ma. God is merciful and He is ever ready to forgive us ous sins once we are ready to accept Him as our lord and personal saviour no matter the weight of our sin. God bless u ma for such a life changing story. ebony is a good example for christian brothers around the world, instead of being sceptical about the strength of God's word, they must accept it for what it is. Which Ebony? The one in thus story or another one. As the Sikh guy used to say in the old British sitcom "Mind Your Language", 'I am not understanding you at all'. A nice story. We have to believe in God at all times, believing that all hope is not lost. It is a suspense-filled story. I am made to understand that as believers we need to "CATCH THEM YOUNG" for the things of God because the devil can use anyone. Such a nice story ma. Can't wait to see the end of it. I have lost count of God's intervention in my life especially at the 11th hour of the situation. If any man be in Christ, he is a new creature. I thank God for Ebony for accepting Christ. But he hasn't done so yet. Thank you ma for this wonderful and fascinating story...we have a compassionate God who is willing at all times to accept us despite the gravity of our sins. Serving the devil is a very poor choice because we will end up losing but walking in the path of Christ guarantees our victory over all obstacles. Thank God for Razor who realized that Jesus Christ is the only way and is the only one who can save her. May Christ help us to know that He is the only solution to all odds of life. Bless you, ma. Serving the devil never yields any good thing because whatever he gives with his right hand, he takes with his left hand. The devil takes more than he really gives and it takes wisdom to see this. It's interestingly ironical that Razor whom Ebony had nicknamed 'devil' became the first to know and accept Christ before Ebony. However, even most people who are serving the devil know that it's a poor choice, but are interested in what they think they Gain at that point. First, the choice of devil will separate you from God, make you lose heaven and lose everything and as a result make you enter hell fire. Moreover, the devil does not give anything free of charge. And whatever the devil gives is ephemeral and therefore must be taken back within a short time. Finally, favouritism in families is becoming too much in our society today. It is the attitude of a parent or parents or guardian showing preference or treating one of his children better than the rest. It can cause the raising of morally decadent child/children (especially the favored ones) and can pitch the neglected children against their parents and cause trouble in the family. Thank you for your rich comment, Chinagorom. Have a wonderful August in Jesus' name. OMG! am totally speechless ma! i seriously was not expecting this turn in events. funny and ironical to note that the person you have condemned and believed already to be beyond salvation and redemption is the first to encounter and accept the Saviour. i have been in lots of hopeless situations and Christ stepped in to right things. however, parental favouritism is something i have never experienced nor observed, at least not in my family but the truth is that in every family, there is that special child that is more loved than the others within the hearts of the parents even if it is not known to the others. Wow....I feel bad for condemning Razor before, it's true that God can use anyone. I've been in a situation where I thought all hope was lost. When I was looking for a place to do my Intership Programme, a helper was sent to me when I almost gave up. Praise God! I wish you more testimonies in the new year, Favour! This story turned out to be something i was'nt expecting to happen. I remember being in a situation where i had lost hope on every side but God showed himself strong in my life. Anyway other than God's way is absolutely not the way to go because "serving the devil is a poor choice because you lose more than you gain". This is getting more and more intense. Thank God for the life of razor. She has been saved and I hope Ebony is too. Cause it seems Anastasia has diabolical powers and only God can save Ebony from her. For the fact that Razor acknowledged that she made a wrong choice earlier in life is a good starting point. I know that God can save her at least after allowing her to feel his presence. Looking forward to a beautiful ending. Evil can't and will never triumph over good because the Lord is good and his power supersedes every other power on earth, in the sea, under the ground and other high places. What more can you say of a man who defeated death, ascended into heaven and is seated at the right hand of God? Razor's soul just got saved the moment she chose the Lion of the Tribe of Judah. The story is really dramatic, a feature story indeed. this story is full of suspense, one can't just guess what happens next. i love the creative style employed in the story. What i have experienced is when i found myself in a difficult situation and i thought I was completely failing but God's mercy brought things to beautiful again. 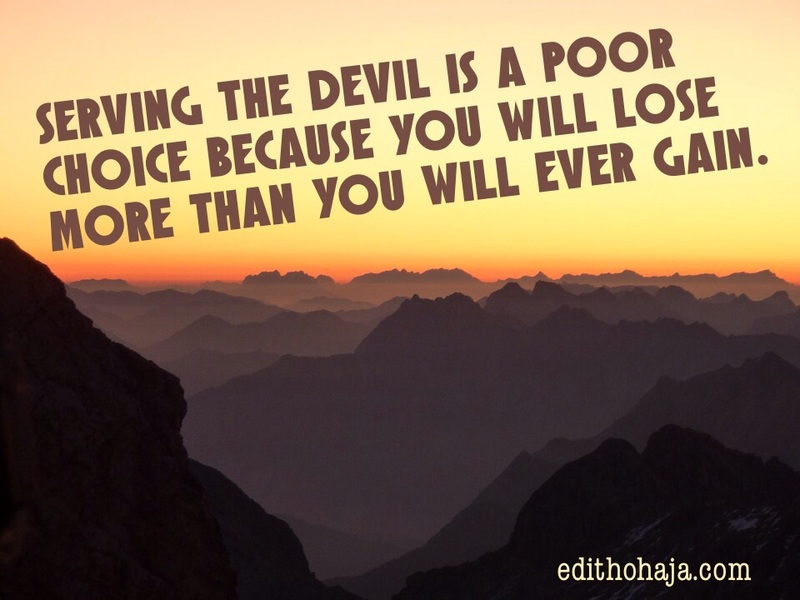 “Serving the devil is a poor choice because you will lose more than you will ever gain” YES! the devil is a liar. He has no fruitfulness and can't give what he does not have. He only plays games with people with empty promises after luring them. Parental favoritism i saw in my compound ended up causing disunity among siblings. The favoured one became "like a sheep in the midst of wolves", when the others noticed his pride and the preference given to him. He was not supported by others. Oh who could have seen this coming, this story keeps growing in amazing twists. To treat everyone equally is the most difficult thing to do, yet it must be done. I noticed that God is more interested in evil people than Good people. Razor, an evil girl saw God and had a second chance. This is amazing. This episode is really unpredictable but very enthralling. I love this. Wow... Just when you think all hope is lost, Jesus steps in and shows you abundant grace and mercy. Nice one ma. God is your strength. Its not a good thing for parents to have favourite out of all their children, its so not helpful to the up bringing of the kids, and I've been in a situation where things are not looking right to me, I call on God most time before looking for someone trustworthy to talk to. Wow! I never expected this kind of twist in this story but it intrigues me and keeps me at suspense to know what will happen to Razor in the next episode of the story. I pray she will be delivered and who knows who just arrived in the compound. I just can't wait for the next episode. Keep it up ma! You know, God is still a big mystery revealing mysteries. At a point where you even hate yourself because of your past oddities, I assure you that he still cares so much. God is never absent to save a soul, just that we are oblivious, but our soul testifies his presence more than our body does. Serving the devil had always been a poor choice as you would end up looking worse than a rag, with debased and depreciated self esteem hanging all around you. It isn't worth it. What a twist! Living for the devil is really a poor choice to make cos the Bible through Apostle Paul stated it clearly that "...to live is Christ and to die is gain. Great piece Ma'am. Wow! the twist in this story is overwhelming. As for parents, its high time they learnt to love their children equally. Bring it on ma. The thief cometh not but to steal, to kill and to destroy. Anything he offers you is nothing short of a weapon for his murder, theft and destruction. Once you receive it you are earmarked for disaster. Parental favouritism always leads to enmity between siblings. Parents must always be on the watch for this in order not to create discord among their offsprings. am experiencing favoritism from my dad but its not affecting me in any way because he still chastise me when am wrong which should be the main benefit of favoritism, even the bible 'to whom i love,i chastise.the gift of the devil is always sorrowful. i thank God for Christ who came for sinners.and even in the midst of our wrong deeds he still gives us a second chance. thank God for the life of Ebony and his sister. WOW, i wasn't expecting things to turn out like this but i am really glad that Razor received Christ and i pray Ebony receives him too. God is wonderful!!! Yes, but with God all things all possible. yes because serving the devil is a poor choice because you will lose more than you will ever again. meaning that whenever you are doing something, you are just doing it for doing sake because nothing will come out of it. No, not really but I believe that they all love us equally, but also one can never tell. I wasnt in any way anticipating the twist in the story,even though I love the suspense.It is now clear that the devils plans for us aren't for good but always evil. Yes, i have. When things turn out to be ugly, trials and crisis in life and all hope is gone, i felt i was just alone, that no one was there for me, but God was there watching. When God stepped in to take control of everything happening in my life, everything turned back to normal, and it was like a dream. Well, I think people know the right thing to do, just that they choose not to do it due to pleasure, but they will lose more. Yes, I have been in a situation where everything good crumbled, shattered and I felt all hope was gone, but God has his ways of doing things for me, what he did was better than what happened to me, it just take patience and faith in him. I think parents should be careful of how they treat their children, the issue of favouritism is not a new thing, its make one child to feel inferior or superior to the other, I think parents should not make it obvious if they have a favourite kid in the family. This story just took a different turn. hehe! our God is wonderful. Razor had spiritual powers all this while? who could have guessed? Tasia is simply an angel. a woman whom God used to do his work, an instrument in the hands of God. Ebony should ThankGod everyday for Tasia in his life. my question now is, what happened to her suitcase? did she forget that one? what's happening? where are her kids? I'm running off to the last episode to find out before suspense chokes me here. she had a concerned look on her face. wow! what's actually happening? The lord works in mysterious way, look out how razor gave her life to Christ there is nothing more assuring than being given a second chance, it just makes you feel like a new person. Ebony was used as a tool to get razor to his house and another major turn as tasia comes back. Am really loving the twist of events. There is this saying I grew up hearing "the devil will give you one with the right hand and use the left hand to collect ten". That pretty much tells u how his dealings are. Am surprised razor was serving the devil but am glad she was getting a second chance at life and i hope she makes up for all she has done in the past. Its never too late to go back to Christ and ask for forgiveness. whoa i didnt see this coming, i cant wait to know what happens next. From all indication, Razor was making money through a fetish way(juju). I thank God she finally met with Jesus. I love the suspense at the end of this episode. I can't wait to see what happens at last. Our God is rich in mercy,He is ever ready to save. He doesn't take pleasure over the death of a siner. Ezekiel; 18.He can turn a killer to an evangelist. As in the case of Razor in this story and Paul in the Bible.